Help!!! Yesterday, I upgraded my iPhone to the latest iOS 9 successfully. This morning, sadly, my iPhone with iOS 9 is unable to transfer music with iTunes. Is there any idea to fix? Many Apple users have met the same problem – Can’t sync playlists/music to iPhone in iOS 9 with iTunes. iTunes is defined as the best way to organize and enjoy the music, and movies users already have by Apple, officially. But this is obviously not true. Many users frequently report iTunes can’t be recognized, the content of iDevice can’t be read and iTunes corrupts for no reason. 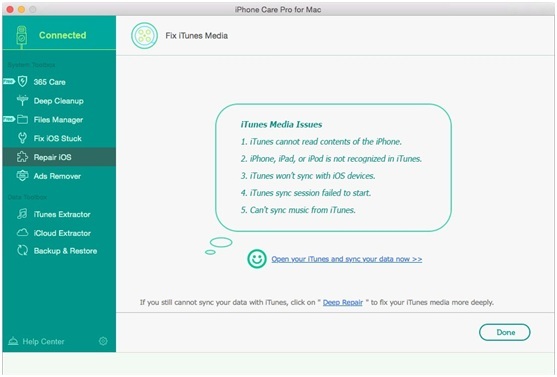 Here we offer you with all possible solutions to solve iPhone/iPad/iPod with iOS 9 can’t sync music with iTunes. If the ways above are unworkable for you, you need an alternative tool to sync music. 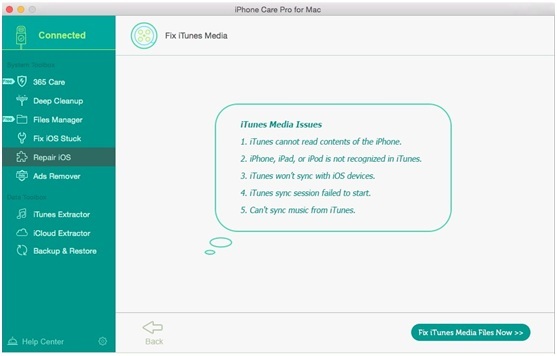 Tenorshare iPhone Care Pro for Mac (Windows Included) offers one powerful feature, Repair iOS, that can fix most iOS system problems such as iPhone with iOS 9 can’t sync music/playlists with iTunes, iTunes can’t be read and recognized. Keep on reading to fix music/library can’t be synced with iTunes. 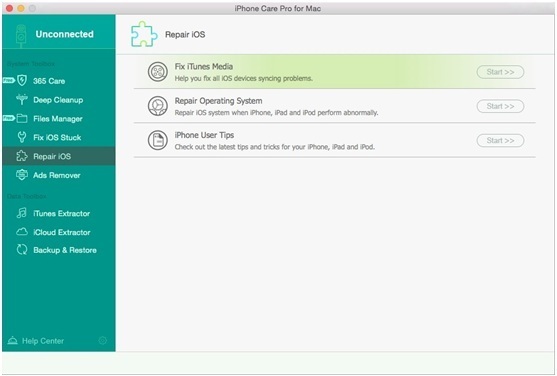 Before that, you need to free download and install iPhone Care Pro on your computer. Step 1. Run the program and you can see the detailed info about memory of your device. Then click Repair iOS in the left green bar. Next, click Start next to Fix iTunes Media. Step 2. Before continue next click, you have to make sure your iTunes is turned off. In this window, click Fix iTunes Media Files Now. Then program will automatically repair your wrong iTunes. After finish repairing, you can reopen your iTunes and try to sync music with iTunes again. Step 3. This is an optional step for you, not necessary. If your iTunes still won’t sync music onto iPhone/iPad/iPod with iOS 9, you are allowed to click Deep Repair to try fixing it.